Time flies fast. We're here again at this time of the year; time for joy, happiness and prosperity. 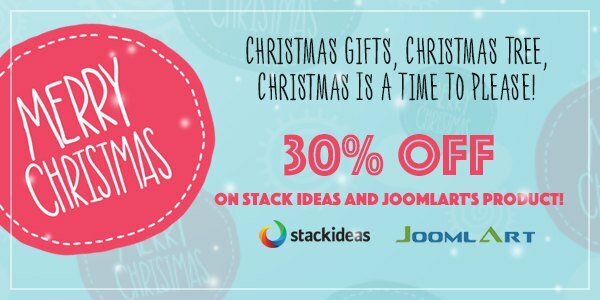 This greeting season, JoomlArt together with Stack Ideas would like to offer YOU the special Christmas deal of 30% OFF on all new subscriptions from Dec 24th, 2014 to January 5th, 2015 with the coupon code: XMAS30. Note: This offer is a single offer which is not applicable to use with other promotions/offers! Grab our Christmas deal now! Or use the coupon code XMAS30 during checkout! Head to Stack Ideas, to find out more about our partner's products and grab our Christmas deal now!